Is there going to be a soft or hard landing? A housing crash or a downturn? Recently Stephen Poloz forecasted the probability of a soft landing in the Canadian housing market at 60% to 80%. But what does soft landing even mean? Soft landing: Home prices grow no faster than the rate of inflation or fall no more than 5 percent. Downturn: Home prices decline by 5 to 15 percent. Bust: This definition comes from Goldman Sachs, which put the lower bound for a bust at 15 percent. We’ll set the upper bound at 25 percent. Crash: Home prices plummet by at least 25 percent. Semantics aside, the real question is which scenario is in the cards. 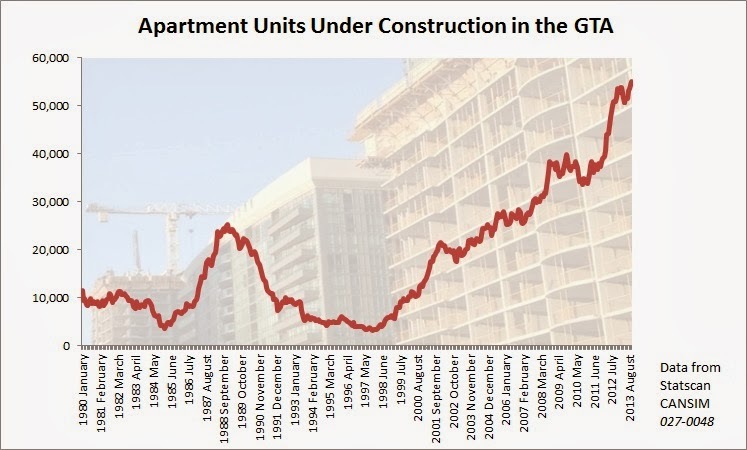 "If the upcoming supply of condos is not absorbed by demand as units are completed over the next few years, there is a risk of a correction in prices". Guess which direction the market is heading. That's right - the supply is rising as the demand wanes. 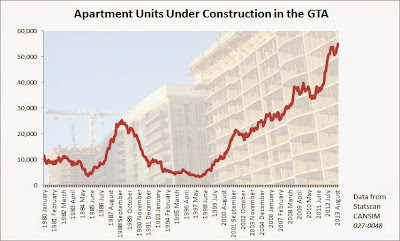 No wonder the condominium vacancy rate in Toronto increased by 50% in 2013 to 1.8% from 1.2% back in 2012. "Moreover, if investor demand has boosted construction in the condominium market beyond demographic requirements, this market may be more susceptible to shifts in the buyer sentiment. A sharp correction in the condominium market could spread to other segments of the housing market with stretched valuations, as buyers and sellers adjust their expectations of the future path of house prices." Last time a shift in the buyer sentiment occurred was in 1989. By 1996 the average home price in downtown declined by 50% adjusted for inflation. History tends to repeat itself. There was a condo bust in the late 80's and it's likely to happen again because the majority of condo owners today are investors. For instance at CityPlace, at least 50% of the condo owners were investors. Finally, earlier this week the governor of the Bank of Canada gave a speech in Montreal with regards to managing risks. Below are selected quotes with my commentary. "At the height of the crisis, although our financial system remained sound, our exports collapsed, causing a recession. To support economic growth, we have relied mainly on household spending, supported by exceptionally stimulative monetary policy." So as exports collapsed and the rest of the world didn't want to buy our sh*t, the government decided to sell Canadian produced crap to Canadians. But there was a problem - Canadians were all ready broke at that time. So what do you do? You make an offer to the consumer that they cannot resist - make the money cheap via low interest rates. Consequently Canadians went on a spending binge pushing the household debt to record levels. In fact, earlier today Statistics Canada reported that debt to income ratio in Canada reached a new record high of 163.7%. The good news (for now) was that the debt-service ratio remained near record low of just 6.98%. But hey, even Poloz recognizes the troubles of low interest rates. "But there are trade-offs, lots of them. Today, the most obvious is that prolonged low interest rates can result in the development of imbalances in the household sector. In Canada, we have seen rising levels of household indebtedness, stretched house-price valuations and overinvestment in housing." 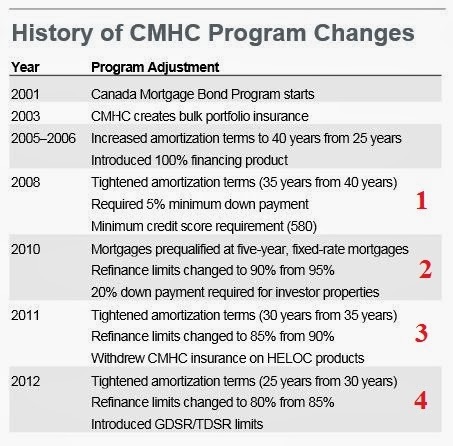 "To address these imbalances, the Finance Minister tightened mortgage insurance rules four times, among other measures, and the Superintendent of Financial Institutions introduced stronger mortgage underwriting standards for Canada’s banking institutions." Think about it for a moment. How worried must the government be about the housing market that they intervened four times. And these changes were not small changes! 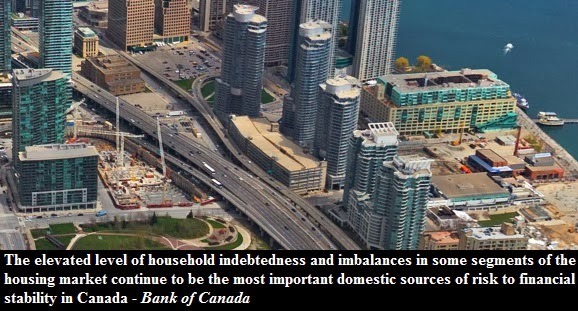 "In the wake of these measures, a constructive evolution of household imbalances began around the middle of last year. Growth in household borrowing has moderated, and residential investment is on a more sustainable track. Those indicators have picked up again, we think mainly because people pulled forward their plans when mortgage rates started to move up during the summer. We expect these imbalances to stabilize and then gradually unwind in coming years." In other words, the Bank of Canada thinks that the recent bounce back in the housing market is temporary. "In our base-case scenario, the Bank expects a soft landing in housing and a pickup in exports and investment. This rotation will relieve the tension between low demand and household imbalances. Nonetheless, the risks around this base case need to be managed. There is a risk that household imbalances could keep building and set the stage for a sharp correction down the road. Such a correction would be a risk to both the Canadian economy and our financial system." This past November condo prices in Toronto rose by 10% while detached homes rose by 16%. The longer this trend continues, the more worried you should be! As Poloz said, it's just setting the stage for a sharp correction down the road. Or put simply, the more the home prices rise - the more they will eventually fall!